To start off we have the monthly pin which always represents the theme for the month, and for this month it is a plane flying through the sky over a palm tree, because who wouldn't want to travel somewhere tropical? Next, we have a mirror that says "As Travars" which means "to travel" and it is from the Darker Shade of Magic Series by V.E. Schwab. I personally have not read the series but I do plan to because I've heard very very good things about it. I've heard it been described as an almost more grown-up Harry Potter. I mean more Harry Potter? Yes, please! After that, we have a small traveling journal to jot down memories and thoughts while on the go. They sent out 8 different covers with one of the 8 in every box. Which cover did you get? There's also a Funko Pop Newt Scamander keychain, so you can always have just a little bit of magic to bring with you on your adventures. The print in this box is the last words from François Rabelais that was made popular by John Green in his book Looking for Alaska. We also were given a cinch bag with a quote from The Lord of the Rings by J.R.R Tolkien on it, which says "Home is behind, the world ahead, and there are many paths to tread through shadows to the edge of night, until the stars are all alight." With this handy backpack, you too can feel like you're going on a great adventure! Lastly, we have the book of the month which is A Gentleman's Guide to Vice and Virtue by Mackenzi Lee in a book jacket that is exclusive to Owlcrate! 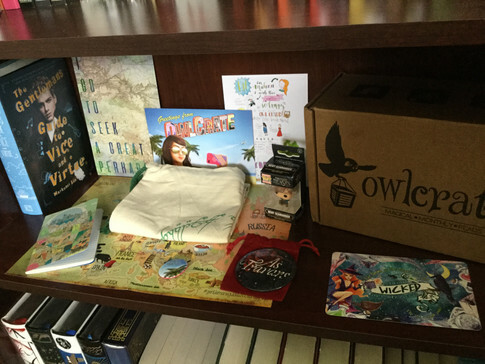 It also includes a signed bookplate, a letter from the author, and map from the book. The book is essentially a road trip all across Europe with the main character, his best friend (who he may or may not be in love with) and the main character's little sister. I've only recently heard about this book and I'm so happy I have a copy, there is a review for it coming your way! On a final note, we also have a sneak peek for the August 2017 box. The theme is "Something wicked this way comes" and I'm very excited to see what book could be coming with it. I'm also happy to say that every box for the rest of 2017 will have a Harry Potter related item in it, so get ready all you Potterheads!